One of the most affordable and most accessible methods to make your smile better is with teeth whitening. At Plaza Dental Group, dental specialists use Rockstar White® professional teeth whitening to create outstanding smiles. In just one short visit, you can have whiter teeth thanks to the skilled dental team at Plaza Dental Group in Ventura, California. To learn more, schedule a consultation over the web or call today. Your teeth can turn yellow for a variety of reasons. The foods you eat and drink, certain medications, and age might all be contributing factors. Surface stains on the enamel of your teeth from drinks like tea, coffee, and red wine, can make your teeth appear yellowish. Tobacco and smoking are also significant causes. Certainly. When you follow product specifications and instructions, whitening your teeth is a harmless process. For reliable, safe results, the team at Plaza Dental Group provides Rockstar White® teeth whitening treatments. You may prefer to get your teeth whitened in only one appointment if you have a busy schedule, or steadily over time with a take-home teeth whitening kit. No matter which course of treatment you choose, the Rockstar whitening solution is entirely safe to place on your teeth and in your mouth. Note that the bleaching agents may cause some non-permanent gum and tooth sensitivity, but this is the only discomfort you might feel. What is involved in a Rockstar in-office procedure? A simple Rockstar in-office teeth-whitening procedure could make your teeth six to eight shades brighter after just one appointment. 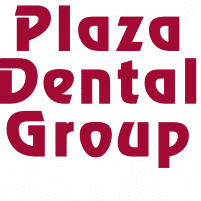 * At your appointment, an experienced Plaza Dental Group team member will fit upper and lower dental trays into your mouth. These trays will contain the hydrogen peroxide whitening solution. Your dental professional will cover your gums and lips to protect them from the solution. They put the bleaching solution in the trays and shine a special bright light on your teeth. The light and bleach work in unison to whiten your teeth as you sit back and relax. Your dental expert applies a gel to your teeth to minimize any post-treatment sensitivity you experience. Then it’s finished. In all, each Rockstar whitening treatment takes about two hours, and then you have whiter teeth and a dazzling smile. In some cases, you may need 2-3 appointments to achieve optimal whitening results. For a more gradual approach to whitening teeth over a couple of weeks, the Plaza Dental Group team also offers Rockstar’s at-home teeth-whitening kits. Call or schedule a consultation at Plaza Dental Group to learn more about Rockstar in-office teeth-whitening treatments as well as take-home whitening options. You don't have to live with teeth stains and discoloration.